I am slightly obsessive about fabric it has to be said. This photo from Laura of Lupin makes me sigh with pleasure everytime I see it. 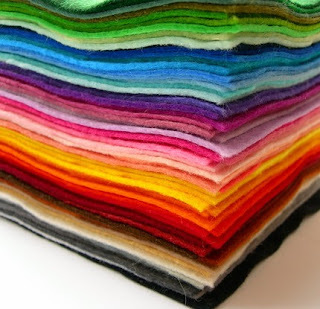 Felt is one of the most amazing inventions in fabric, I think. A fabric that doesn't fray and has so many uses you can never get bored of it. I use it a lot in my own work and love seeing it being used in many different ways by other designers and crafters. Here are just some of my recent favourites. 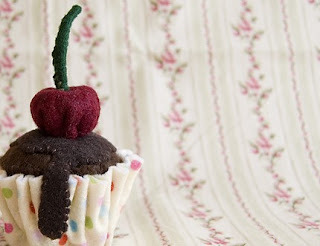 Yummy felt treats from the talented British Cream Tea, this chocolate cherry cupcakes makes me want to put down my needle and bake. Not only beautiful but practical too, Picciolo's felt storage boxes would brighten up any desk or workspace. How could all of these items not inspire you! 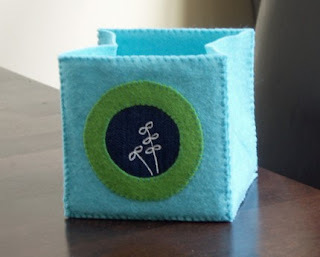 it makes me want to raid my supplies and start stitching and experiamenting with all the wonderful things felt can do. Or just take your inspiration from Fuzzyfish and just immerse yourself in it, literally. Hi,thanks for including one of my little boxes! I love the cupcake too it looks delicious, and I wish I had as much felt as in the last photo!